The CIHS has more than 10,000 digitally archived items on our website, including: family letters, newspaper articles, photographs, postcards, and audio recordings. In this photograph, circa early 1900's, President Theodore Roosevelt (fourth from left) on a visit to the Snyder School during his fishing expedition to Captiva for devil fish. 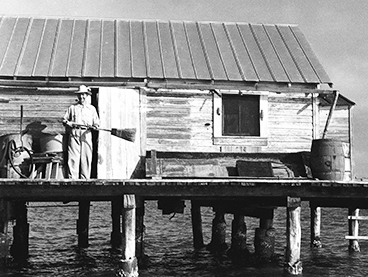 This photo is Bill Stevens at his fish house taken by locally renowned photographer Charlie McCullough in 1949. Bill Stevens worked for the Punta Gorda Fish Company. The local fisherman would bring their catch to him and he would put them on ice and await the company's fish boat to come to collect the fish. This image is the first schoolhouse on Captiva, established in 1901 by William Herbert Binder. The building is now the Captiva Chapel by the Sea. The school was attended by students who lived on both Captiva and Sanibel Island. David Wightman is pictured harvesting raccoons on Captiva in 1919. The Wightman family arrived on the islands in 1917. 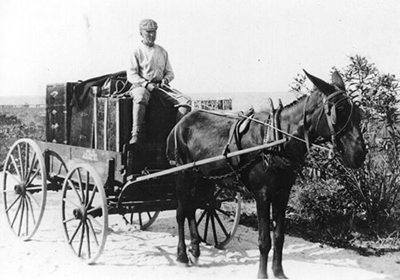 In this image from the early 1900s, John Morris and his mule picked up mail and passengers from Randall’s Dock on Captiva. Morris was a long time island resident and lived where Jensen’s twin Palm Marina & Cottages is located. This is image features Mrs. C.B. Chadwick, family and friends near one of their cottages at South Seas Plantation, sometime after 1923.